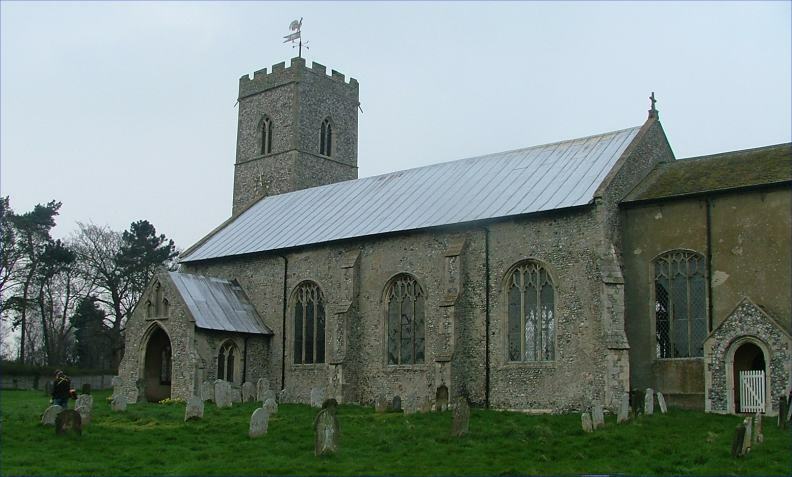 It is always a pleasure to visit churches in this part of north-east Norfolk, because they are virtually all of them open, and welcoming with it. The landscape near the coast here can sometimes be a little bleak, but St Peter and St Paul is nicely tucked away in its little village, sheltered in a fold of the hills that lie just inland. As usual around here, a 15th century rebuilding has left big windows and a building full of light. A refreshing difference is that the tower is offset, suggesting that the original church was to the north of the present one, although I am not entirely convinced by this. The priest door in the chancel has its own little porch, a smaller version of the one at nearby Trunch. These are very unusual; presumably, someone local thought it was a good idea, which it is, and you can't help wondering why there aren't more of them. Like Needham Market in Suffolk, Knapton's otherwise fairly run-of-the-mill late medieval church is saved from mediocrity by one extraordinary feature, its roof. The double-hammerbeam is also one of the widest, crossing about 12 metres in a single span, a remarkable feat. However, while it is the technical brilliance of Needham Market that makes it outstanding, here at Knapton the roof is more reminiscent of another great Suffolk roof, Woolpit. 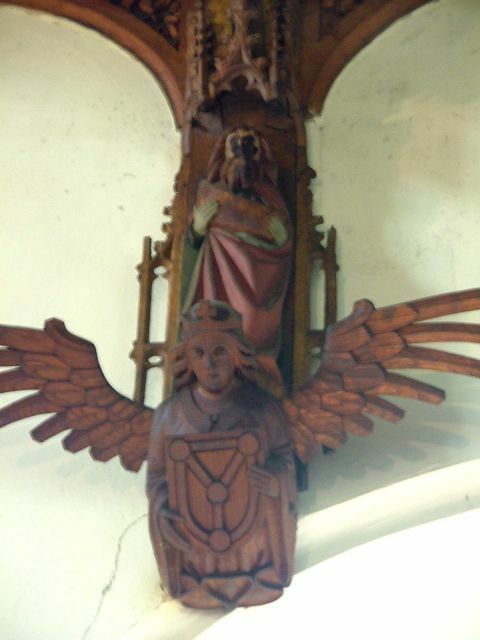 As at Woolpit, the vast array of angels and other figures creates a sense of business, as though we are looking up into, I suppose, heaven itself. But these are no mere decoration; rather, they were probably intended as a psalm of praise, a liturgical adjunct to the devotions of the Catholic faithful in the nave below. For this reason, they were frowned on by protestants and in many cases destroyed; at Woolpit, the puritan iconoclast William Dowsing found no fault with the angel roof during his visit of January 1644, because it had already been stripped of 'superstitious imagery' by the Anglican reformers of a century earlier. So virtually all the angels there are Victorian. I was interested to come across recently an 1882 report from William Morris's Society for the Protection of Ancient Buildings describing a visit to Knapton church. The SPAB was in the habit of dropping in on medieval churches which were undergoing restoration to make sure that the job was being done properly. At Knapton, the late Victorian restoration was at the hands of the great George Gilbert Scott. 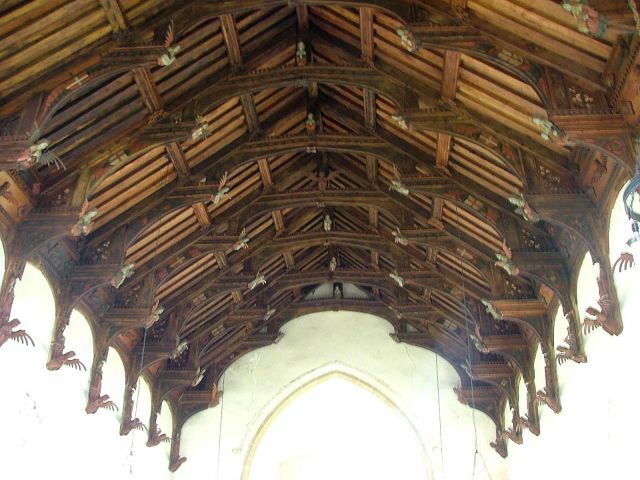 The Society journal records that a deputation from the Society having visited this church, about to be restored by Mr. G. G. Scott, reported that it was of great architectural value, possessing among other things a very fine old Perpendicular roof, rich with carving and painted decoration. A letter was addressed to Mr. Scott by the Committee, explaining their views as to what ought and ought not to be done, which Mr. Scott received in a very friendly spirit, expressing his agreement with the views of the Society in this instance. 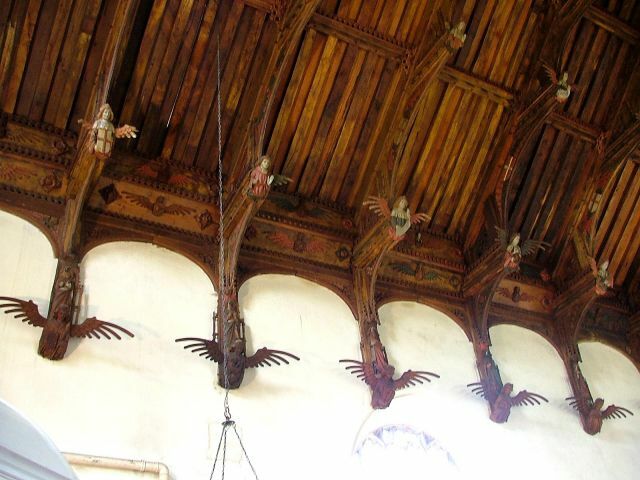 Here at Knapton, many of the angels do appear to be medieval; but in any case the great restoration of the roof here was in the 1930s, and the larger lower angels date from this time. Perhaps we may assume they were rather more careful about restoring the others than they would have been half a century earlier, and this is why so much sense of the original is retained. The wings are great, and create a sense of movement, but otherwise it isn't as atmospheric as Woolpit. 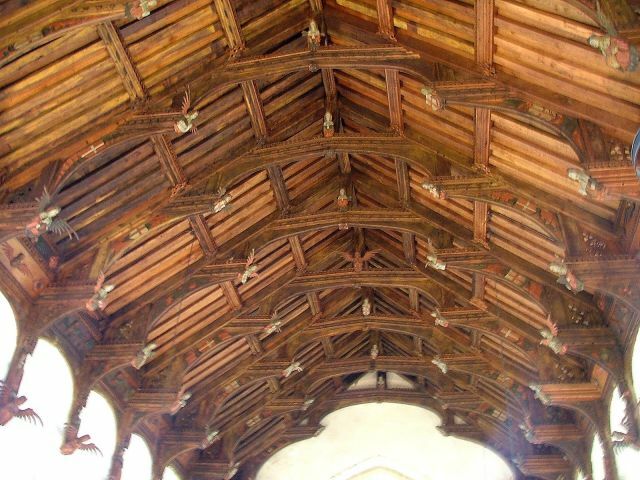 Knapton's restored roof is done well; it is technically brilliant, but not magnificent. The angels may flutter, but I am afraid that the heart doesn't. Below the great roof is one of the great Norfolk font covers, a beautiful white 18th century Palladian affair bearing the palindromic Greek sentence NIYON ANOMHMA MH MONAN OYIN - 'wash my sins not my face only'. A cover of this description was noted at Hingham in the 1840s, but did not survive the comprehensive Victorian restoration there. I wonder if this could be the same one? There is a spectacular deep-cut ledger stone with a skull and winged egg timer for the appropriately named Richard Flight, and a single pre-Reformation brass inscription still asking for prayers for the soul of its owner. The heartily restored rood screen has curious little gates with fluted columns. I liked Knapton for being unusual and idiosyncratic as much as I did for its roof.